Castrol 10W60, Motul 15W50, Shell Racing 10W60, Agip 10W60, Liqui Moly 10W60. the engine oil testing was mainly used in NSHW and Sepang circuit during track and time attack, we are not paid by any brand owner to any word favourable to them, but would also like to thank the brand owner for letting us try out the product. All reading are recorded via AIM Datalogger x 2 and 1 x Racepak Datalogger on 3 different car, AIM and Racepak datalogger are reputable race data anaysis manufacturer hence if any questions to the reading reliability you can contact me directly for verfication to have a look at the data. Agip 10W60 : had been running Agip 10W60 last year September time attack, although during the actual race 2 of the trial car pull out due to weather, for most of the track event during practise both car were running well. I had recorded a oil temp of around 120 degree nearly 130 for both car which happen to be on 2 different datalogger AIM and Racepak, also to note that both car is using dual air cool oil cooler and water to oil heat exchanger hence any temp near the 130 mark is consider HOT. Shell Racing 10W60: try out the oil during a track event, similary 2 car were trying out the this oil. my personal take and feel its good when the oil is fresh after a certain mileage like 2000km over sluggish, but feel is alway just feel, back to actual trial during the track event. a same number of lap was put in, at about the same sort of weather, as to the difference in intake airtemp, air humidity, and other stats i should not go into but its almost identical, again reading from the 2 datalogger is within 1-2% of each other. The temperature was slightly lower at around 120 degree somewhere between 120-125 degree, which is effectively about 2-3 degree lower then the oil previously tested, we were pretty happy with the way it cool down as well. 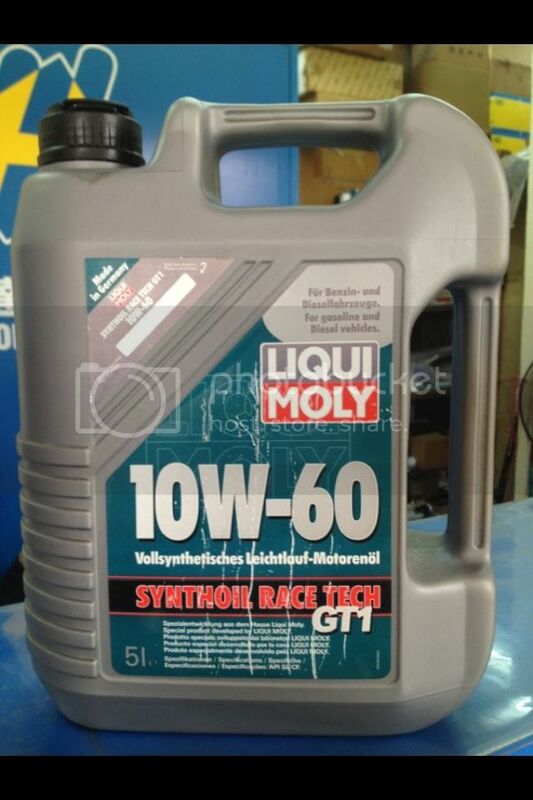 Liqui Moly 10W60: for this oil 3 car was on trial instead on 2 with the 3rd car running AIM datalogger as well. overall impression on NSHW was quite immediate as the oil seem to lubricate better but again we do not do any review base on feel, hence a check across 3 data logger shows that on highway at the same driving pattern we achieve 1-2 degree lower at any 1 point of time, note that the weather was around the same, same set off timing, maximum 1-2 degree air temp difference across all 3 oil. during tracking and warm up, all 3 car datalogger shows that Liqui Moly 10W60 is in fact 2-3 degree lower with a reading of not more then 122 degree not lower then 118 degree as well, achieve much rapid cool down comparing to Shell 10W60. again due to weather, only 1 car participate on the actual time attack which was a wet race, as to how he feel the oil and data reading from the datalogger i would let him continue from here. Any lab test on the oil used after the track?The reason why i'm asking is because my nature of job involves designing & building industrial heavy machineries which are required to run 24/7. Other then oil temperature monitoring, we drain the lubricating oil out after test benching our prototype machineries & send them for laboratory testing and analysis. how did castrol 10w60 fair? Here is my simple data on the different types of engine oil I've used on Sepang . So far my take on LiquidMoly 10W-60 after trying for the first time , even now after coming back from Sepang 8 weeks ago with still the same oil , engine is remarkably smooth. Not like some other oil where you can feel the roughness at 3000km mileage . Only Mutul V300 comes close but Mutul is very ex . My last Oil temp is way below 100 in Sepang even though I was pushing hard . But to be fair it is raining on track that day . On a normally sunny day in Sepang , it is very easy for my car to exceed 130 degrees when using supersport mode / 1.6 bar boost during 2 superlaps . Will keep updating after every track . When i was tracking i tried various types of oil and could never reduce below 125deg at sepang. At the highest, peak temps were around 140deg with my original stock cooler and thermostat. What worked for me was a secondary oil cooler and tomei thermostat killer - with this combo my max oil temps were reduced to around 115-118deg after 2-3 hot laps. Of the mods, the tomei thermostat killer was the more bang for buck. Hw about Elf and Redline? Too bad I didn't record my temps before installation of HKS oil cooler and HKS thermostat . But you are absolutely right . The thermostat is damn cheap and bang for buck ! I recommended Alan9955 to install the HKS thermostat . He also said damn good can really see the difference .